I'm thinking about using a CM3 in a project, but it needs WiFi. Apparently, the RPi 3B has a BCM43143 WiFi chip, but this doesn't appear to be readily available in modest quantities. And it is probably overkill, since I don't need an FM receiver, and I probably won't need Bluetooth. So what's the easiest WiFi chip with an SDIO interface that will work with a minimum of bother with the CM3? I'll probably be using Yocto to build a custom Linux, although any chip that works with Raspbian should be okay. I can tell you one to avoid (at least for now). I've been trying to get an ATWILC1000 module working, but the driver support isn't there yet. There's a wilc1000 driver in drivers/staging but I wasn't able to get it to work (though it's being actively updated in the staging-next git repo). There's also an out-of-tree version published by Atmel but it doesn't build in 4.4 or 4.9. I'll probably kick that one to the curb and look for something else. One possibility is a USB based Wifi adapter. Since I plan on having a USB hub chip on my carrier board anyway I'll add a type-A jack and plug in one of the off-the-shelf tiny USB Wifi dongles. Make it Bluetooth 5 LE + Wi-Fi with QCA4020 from Qualcomm. Here's some good news for you I ended up looking into this for my own project and I came across the ESP-WROOM-32. I've managed to fabricate the package/footprint part on Eagle if you're using eagle then I'll happily supply it for you to use. Below is the schematic I did for mine. You can power it using 3.3V or via a 5V to 3.3V convertor which is the design on the right hand side. 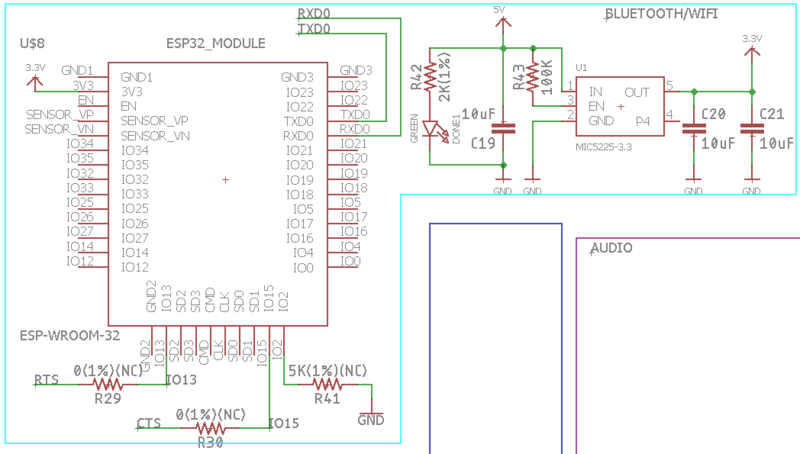 Connect RXD0 to GPIO15 & TXD0 to GPIO14 this is your UART Serial which connects directly into the CM3 as there is no need for a UART to USB Convertor atleast for my project I didn't need to use it and it simplifies the build down alot. However you're welcome to use one. The chip that is used for converting to USB is CP2102-QFN-P28. I've also made a footprint/package for this on eagle as well. I've had good experiences with TI WiLink chips, connected via SDIO. They exist in the form of pre-certified modules from a number of vendors (I used a Jorjin WG7831DELF). WiLink8 chips will do WiFi and Bluetooth, in various bands, depending on the specific option you choose. TI supplies Linux drivers, which work. The module you suggested sounds like what I'm looking for but I'm struggling to find the drivers. Can you point me at them? Thanks! Does anyone know the interfaces (port pins) on the Pi 3B BCM2837 SoC for the Wifi/BT chip CYW43438 (was BCM43438)? and part is available from US distributors Arrow, DigiKey and Mouser. So can this be wired to the CM3 to match the Pi3B? Is there a reference design/schematic? I understand that this would require US FCC Part 15 certification for the RF transmitter. Last edited by mkirk on Fri Apr 27, 2018 7:25 pm, edited 1 time in total. I have no direct experience - but this seems an educated guess - atleast a place to start. I've highlighted the relent connections + note the x4 extra BT PCM audiopath connections (not required for WiFi / BT). There might be secondary connections such as Reset / PowerDown... I cannot be sure, but these are the main SoC interface connections. We discussed this also here Which Wifi/Bluetooth chip does the RPi 3 model B integrates? Thanks to all for the great information! JBDynamics: Were you successful at implementing the TiWi-BLE chip with the CM3 running 4.14.71 kernel? I am doing the same, I used the in-tree kernel drivers which supplied WLCORE, WLCORE_SDIO and WL12XX. I applied all other tools from WL18XX build scripts. I struggled with the DT but finally managed to get he WLAN up and running. However, I cannot get the WLAN_EN pin to be toggled by ifconig wlan0 UP/DOWN. My device tree voltage regulator (wlan_en_regulator) is working fine and mapped correctly. As a workaround, I currently have the voltage regulator set to "always-on" which brings up wlan0 at boot. I also tried "regulator-boot-on", which it is initialized but is quickly disabled, then nothing. My SDIO node includes the vmmc-supply = <&wlan_en_reg>; but seems to be doing nothing. GPIO 43: level=0 fsel=1 func=OUTPUT >> as WL_EN. But right now I just hook the WL_EN (on WL1273 side) to 1.8V to make it always HIGH. Unfortunately I still failed to make the WiFI on. Nothing happen. Even I always get make-error when try to do the steps from http://processors.wiki.ti.com/index.php ... d_Scripts . Do you mind to provide the step what you did to make the WiFi on? Hello everyone, I would like to start a project with a CM3 + adding a Wi-Fi and BT module. Alone I can not and I would be willing to pay those who help me. I was thinking of using the LBEH5HY1MW of the Murata where it uses the CYW43455 which is lost to the Raspberry Pi 3 B +, but I could also change and use another one. Someone is willing to help me? jrschueler: NOOB here, struggling as well, can you elaborate or link to what you did in DT in order to have WLAN up? Hey, thanks for those informations, i will try to use ur solution. I just have a few questions. I have the CM1 with intergrated memory, i want to connect it to the internet via wifi and connect mouse and keyboard with bluethoot. What software do i need to install and can you give some instructions how its done. Its my first time doining it. Btw im using eagle so if u coule send me the footprints that would be awsome. Im not sure if the pinout is the same but ill check it. Does somebody succeed in getting the wilc1000 driver works ?